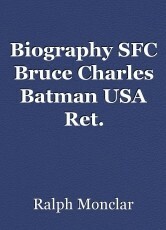 Biography SFC Bruce Charles Batman USA Ret. Biography of a fine NCO and the dozens of people who admired him. Ames High School (1921 Ames High Drive, Ames, Iowa 50010) graduate, class of 1960. Army schools: Defense Language Institute West Coast (DLIWC), Fort Devens, Goodfellow AFB. Teufelsberg (USM-4) Operations Training Branch (OTB) NCOIC, U.S. Army Security Agency Field Station Berlin (USASAFSB) 1976 time frame. Magnificent instructor, designer of training programs, leader, and friend to all. Raymond Oliver Abbott/Raymond O. Abbott/Raymond Abbott/Ray Abbott (1947-) “Rabbit”, Married Pamela J. Abbott née Pamela J. Solley. They settled in Pasadena, Maryland after a tour at Fort George G. Meade/NSA. Patricia Ames/Pat Ames SSG at the time; wanted to go to Warrant Officer School. Raymond Anderson/Ray Anderson Originally from Washington, DC. Anthony Antonello/Tony Antonello SFC; a platoon sergeant. Randall Baker/Randy Baker Originally from Chattanooga, Tennessee. By no means a fan of the author. William H. Banks/William Banks/Bill Banks CO of A Co. late 1975. Jeri L. Barnitz/Jeri Barnitz/Jeri L. Condra/Jeri Condra (1955-) Originally from Upper Arlington, Ohio; brother of LCPL Douglas Wanner Barnitz/Douglas W. Barnitz (1949-1969) MOS 2531-Field Radio Operator 3rd PLT, D Co., 3rd RECON BN, 3rd MARDIV, III MAF KIA Qu?ng Tr? 4 June 1969. Jeri married Randall Alan Condra/Ranfall A. Condra/Randall Condra. John W. Case/John Case Originally from Missouri. A great runner who came in fourth in the Spandau Marathon of May 1976. Michael Chartrand/Mike Chartrand “Char Baby” Originally from Watertown NY. A displaced Canuck: fell in the St. Lawrence River one day, floated around for months, never found his way back home. Michael Dailey/Mike Dailey "Bud" Originally from Texas. Librarian and bookworm. Rick Estberg (c. 1951-) Graduated from Ripon College, Wisconsin in 1975, spent 7 years total in Berlin, and you can read about his status as a talking head in Alumnus Rick Estberg ’75, a National Security Agency employee, will speak Oct. 2 “Posted October 1, 2015 in Alumni, Center for Politics and the People, Special Event by Jaye Alderson.” He’s a petite scène actor, genealogist and occasional toastmaster. Edward C. Fassett, Jr./Edward Fassett/Ed Fassett (1952-) Originally from New York. He’s a lawyer in Duanesburg. Stuart Lee Fehr/Stuart L. Fehr/Stuart Fehr/Stu Fehr (1952-) Originally from Illinois. 1972-1975 Basic and Intermediate Russian at Defense Language Institute, Monterey, California; 1975-1981 B.A. in Foreign Languages from University of Maryland, European Division; 1982-1986 Russian and German translator and analyst US Army, Germany; 1986-1990 Russian translator of newspaper ‘Pravd’ for Associated Publishers, Inc. Huntington, Tennessee; 1990-1998 German translator and Liaison Officer for US Army, Germany. Address 301 Carlisle Drive, Champaign, Illinois 61821-6439. Close friend of Jack K. Holman. Rebel M. Frick/Rebel Frick Oklahoma. You don’t forget a name like that. David A. Fulton/David Fulton/Dave Fulton Originally from Washington. Ft. Devens — Master Sergeant Russell D. Ganong, presently assigned to the 509th Radio Research Group*, Viet-Nam, recently received honors as the Distinguished Graduate, Senior Non- commissioned Officer’s Course at the USASATC&S, Ft. Devens. MSG Ganong was also the class leader. MSG Ganong receives his diploma and congratulations from Colonel Robert W. Lewis**, Deputy Commander, USA- SATC&S. *Replaced the 3rd Radio Rsearch Unit (RRU); commanded three battalions and company-size direct support units assigned to all Army divisions. One subordinate battalion was the 224th Aviation Battalion (Radio Research), which pioneered in the introduction of Special Electronic Mission Aircraft (SEMA) to the battlefield. At the height of the war, the 509th Radio Research Group commanded some 6,000 ASA personnel in-country. Meanwhile, the agency itself had greatly expanded, reaching a strength of 30,000 and attaining the status of a major Army field command in 1964. **1923-1998; made Colonel before he retired. Buried in Fort Devens Cemetery, 35 Patton Road, Devens, Massachusetts, 01434. Reva Ann Grantham/Reva A. Grantham/Reva Grantham née Reva Ann Shank (1952-) Originally from Brookville, Indiana. Tread ? retread = lifer. Elder R.C. Green/Elder Green 1SG Co. A; preceded Russell D. Ganong. Jerry Chester Haggin/Jerry C. Haggin/Jerry Haggin (1952-) Originally from Sioux City, Iowa. If you need a fine soloist or an accomplished choir member, call Jerry. James P. Hall/James Hall/Jim Hall SFC; a platoon sergeant. Philip Drake Hershey/Philip D. Hershey/Philip Hershey/Phil Hershey (1950-) Ran Subsystem E. Lifer. Lead, Network Administration at AGIA, Carpinteria, California where he lives. Edward W. Hill/Edward Hill/Ed Hill Captain in charge of S2. Ronald E. Hintz/Ronald Hintz/Ron Hintz SSG A&R NCO. Jack Kerry Holman/Jack K. Holman/Jack Holman (1952-) “Smilin’ Jack” Originally from California. Superb French, German, and Russian linguist whose finest moment came as then SFC Jack K. Kolman was Russian and DLI team leader for translating important source documents noted in International Cold War Military Records and History Proceedings of the International Conference on Cold War Military Records and History Held in Washington, D.C. 21-26 March 1994 Sponsored by the Office of the Secretary of Defense and the United States Army Center of Military History edited by William W. Epley Office of the Secretary of Defense 1996 CMH Pub 70-49, 21-26 March 1994, Crystal City Doubletree Hotel, 300 Army Navy Drive, Arlington, Virginia 22202. Sandra Lee Holman/Sandra L. Holman/Sandra Holman née Sandra Lee Leistner (1946-) Originally from Pennsylvania. Children Ian Christopher Holman (1980-), Patrick A. Holman. Joan C. Introne/Joan Introne 1LT at the time. Ran collection at Teufelsberg. In May 1982 she was one of eight authors of R&D Plans for Army Applications of AI/Robotics SRI Report Number ETL-0296 DTIC Ad-A118277 and Natural Language Processor as a Universal Front End to Expert [incomplete] DTIC ADA138455. Nancy Jean Kalbrener/Nancy J. Kalbrener/Nancy Kalbrener now Nancy Jean Boyle/Nancy J. Boyle/Nancy Boyle née Nancy Jean Klewicki/Nancy J. Klewicki/Nancy Klewicki (1953-) Originally from Williamston, Michigan. With husband Michael R. Boyle/Michael Boyle/Mike Boyle and Becket the dog runs the Maple Leaf Inn, a B&B in Barnard, Vermont 05031 on 16 acres. In 2014 she played Officer Welch in Marvin Neil Simon’s (1927-2018) Rumors (1988) at the BarnArts Center for the Arts. APK (1951-) “The Hero of the Fulda Gap” “Morale NCO”, “Rastus”, “Whippin’ Boy”. “Famous for “How’s your morale, troop?” Nomesayin? Bruce Eric Kipp/Bruce E. Kipp/Bruce Kipp Three tours of duty (1972-1974, 1975-1977, and 1980-1983)! Author of Reichpaper: A Guide to Civil & Paramilitary Identification & Membership Document of the Third Reich (Mackerin Marketing Associates Inc., 1995). Married Maryann Kipp née Singer in Monterey 20 November 1974. Linda Komo “The Sunshine Lady” Originally from Jackson, Michigan. USASAFSB Co. A Commander in mid-1978. Stefan W. Kulmala/Stefan Kulmala/Steve Kulmala (1950-) Originally from Louisiana. 146 Cmr 456 APO AE 09011-0002. He tried to be mysterious, but his loc was easy to figure out. Photobucket (entitled U.S. Army Security Agency Field Station Berlin APO AE 09742 by AlexanderVasilyevichKolchak). associated with USASAFSB and Teufelsberg. Thomas E. Langenfeld/Thomas Langenfeld/Tom Langenfeld (1942-) Originally from Wisconsin. CO of A Co. mid-1975. Last worked for BAE in Arlington, Virginia. Gerald A. Lechliter/Gerald Lechliter/Jerry A. Lechliter/Jerry Lechliter Esq. (1943-) Originally from Delaware. Russian linguist, long-distance runner in his spare time. Eventually retired as Colonel in 1999 and settled in Lewes, Delaware. Talking head for those who hate G.W. Bush and John McCain; self-described “left politically”. David G. L’Etoile/David L’Etoile/Dave L’Etoile “l’Etoile du Nord”. Made SFC April 1971. A second-floor-honcho of some sort. Francis Xavier Lillis/Francis X. Lillis/Frank X. Lillis/Frank Lillis LTC FSB XO. Charles Theodore Mielke/Charles T. Mielke/Ted Mielke Originally from North Dakota. John E. Miller/John Miller SSG; a platoon sergeant. Al Mott Team lead for the Sylvania GTE LE FOX GREEN installation. Michael J. Mullen/Michael Mullen/Mike Mullen Originally from California. The infamous “Moon Mullen” aka “The Screamer” from Co. A 2nd floor. Mark A. Nyenhuis/Mark Nyenhuis “FTA” Originally from Michigan. FCC Registered Amateur Radio License Call Sign KM4PCH, Licensee ID L01985422 2015-2025 Knoxville, Tennessee. John Pepe Civilian, Army Education Center (AEC), ran the learning center in the basement of USASAFSB Co. B, Building 903; frequent visitor to Teufelseberg where he peddled his brochures from OTB. James D. Phillips/J.D. Phillips/James Phillips/Jim Phillips “Duke” “J.D.” “Los” (as in “What seems to be the los?”). Originally from one of the Carolinas. Photobucket (entitled U.S. Army Security Agency Field Station Berlin APO AE 09742 by AlexanderVasilyevichKolchak). Brian Quinn, PMP Originally from the Bronx. The fanatical runner who averaged 130 miles weekly and who won the Spandau Marathon in May 1976. Ronald H. Radzai/Ronald Radzai/Ron Radzai Originally from Pennsylvania. Self-employed in Los Angeles, California and Quakertown, Pennsylvania doing translation work. Co-authored Russian Traditional Culture: Religion, Gender and Customary Law (Taylor Francis, Inc. Routledge ISBN 10: 1563240408 ISBN 13: 9781563240409) 1992 with Marjorie Mandelstam Balzer. Translated Shamanic Worlds: Rituals and Lore of Siberia and Central Asia (1990, 1997) by Marjorie Mandelstam Balzer. William J. Sciore/William Sciore/Bill Sciore (1947-) “Mr. Lotto” “Wild Bill”. Originally from Philadelphia; introduced everybody to the term “mackerel-snapper”. Greatest fears: Communism, impotence, poverty, herms. We think he still has an unsettled account at the Fischrestaurant Anfora, Siemensstraße 27, 12247 Berlin, Germany. He does martial arts now. Patrick Anthony Ulmen/Patrick A. Ulmen/Patrick Ulmen/Pat Ulmen (1931-2017) Colonel MI. 83d Radio Research Special Operations Unit c. 1969. Lawrence Vrooman/Larry Vrooman “Zoomin’ Vrooman”. Originally from Texas. Darryl E. Warfel/Darryl Warfel (1948-2012) Originally from Pennsylvania. James S. Youlen/James Youlen/Jim Youlen (1955-) Originally from Deerfield, New York. The best pecker-poker ever to punch a CHUBBUCK card. FCC Registered Amateur Radio License Liverpool, New York, Call Sign KC2WAW, Licensee ID L01527230 2009-2019. “The basic overall lesson plan was presented pretty well. I’m glad it wasn’t straight-laced, military and without quizzes. My retainability would have only been about 20%. It was great for us to bullsh*t. We went in depth about certain problem areas dealing with single-channel. My retainability is a little over 50%! The class was interesting overall, but in some areas it was dry and boring. I have hopes for this new system but the class should be divided between single-channel, multichannel and TAs. Single-channel operators will have enough problems operating their own machinery, than to have to worry about multichannel equipment. I don’t think we should have covered the USSIDs. More time could have been spent on the equipment. The first day our view-graph broke down and I wasn’t able to follow the lesson on the keyboard set-up. And it was cold in here! I have no complaints about the class arrangement. The instruction most times wasn’t boring. A single-channel SOP should be completely different from multichannel. And I’m sure it will be change doften with the many problems we’ll be facing. The plan of instruction should deal only with LFG---no USSIDs etc. Good overview, but not needed. John Fowler and APK are good instructors. For one thing, the class was lively!! Thank God. I will definitely get my sh*t together with this new system when I have equipment in front of me and start from there. The initialization was good---now I know the basic concept of LFG. That’s it until January 15th.